Last September captcha designed, tested, and optimized designs for dipole PCB antennas in order to allow anyone to simply order low cost and high performance antennas for their RF projects such as Moteino. He made these designs available on OSH Park here: https://oshpark.com/profiles/captcha. Many forums users have used these designs and found them to perform better than the 1/4 monopole antenna which ship with the Moteino giving either a longer maximum range before signal dropout or a stronger signal at the same distance. Since then, captcha has done even more characterization of various antennas and shared his methodology and results here: https://lowpowerlab.com/2017/08/17/simple-monopole-antenna-testing/. There is excellent information in both the original PCB antenna thread as well as the antenna shootout post and I do recommend that anyone interested check them out. Building on captcha's original work, I wanted to offer smaller and much lower cost versions of the same PCB dipole antennas. The price from OSH Park probably isn't an issue for those of us who live in rich countries, but not everyone on these forums lives in a rich country. Plus since captcha's original work, we have become aware of lower cost PCB fabs which produce great work. At the same time, I shrank everything down as much as possible around the resonators to try to get the antenna to fit within the smallest (and cheapest) board area possible. 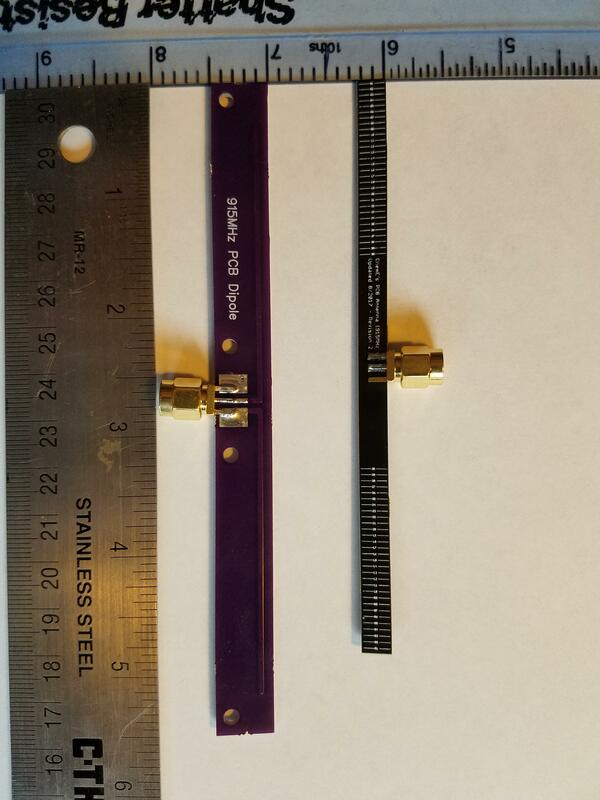 There was also some discussion in the original antenna thread about wide resonators and the fact that they allow for wideband antennas and may also allow for a reduction in resonator length (remains to be tested at the time of writing). 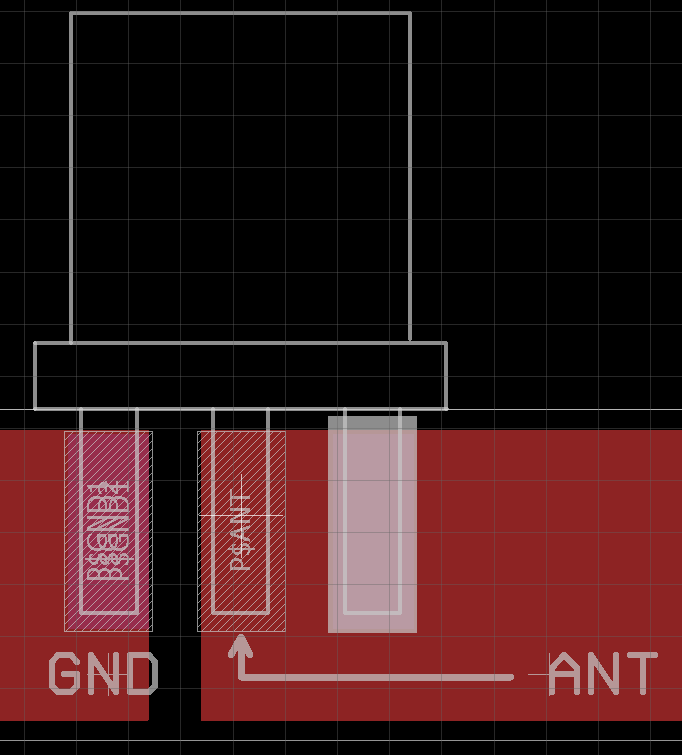 There is no electrical connection between the rightmost prong (GND) and the copper rectangle beneath it (ANT) even though they are only separated by the solder resist and silkscreen layers. From there, I just had to shrink the board around the resonators right up to the 15-mil offset that PCBs.io requires between copper and the board edge. The final result of this optimization is shown below for 915MHz. Some savings in length but the real board area savings comes from compacting everything into the minimum allowable board width of 0.25". Perhaps it is a reduction in PCB around the resonators or perhaps it is due to the widening of the resonators, but this small test would suggest that the new design is no worse than the standard and perhaps it is more sensitive. My designs are shared on PCBs.io and the direct links and costs are below. A cost reduction of around 72% without any apparent sacrifice in performance. I will attach the eagle files to this post in case anyone would like to modify my designs. PCBs.io ships free to any country in the world (how is this possible?) so these should be usable and affordable to just about everyone. Note the the connection between the end of the pigtail to the male RP-SMA jack is around 1.6cm in length so you need to subtract this distance to get your nominal pigtail length. Male RP-SMA connectors for 1.6mm thick PCBs: http://www.ebay.com/itm/1Pcs-RP-SMA-Male-Jack-Pin-Solder-Edge-1-6mm-PCB-Clip-Mount-5-08mm-RF-Connector-/272619688310? Any objection using this IPX (on moteino side) and solder the other side on PCB Antenna instead using SMA connectors ? As far as I know, that would work as well or better since you don't have the loss associated with the connector and you can ensure that your length from the ANT pin of the RFM69 to the nearest edge of the dipole is exactly your ideal feedline length. And it makes the cost substantially less! 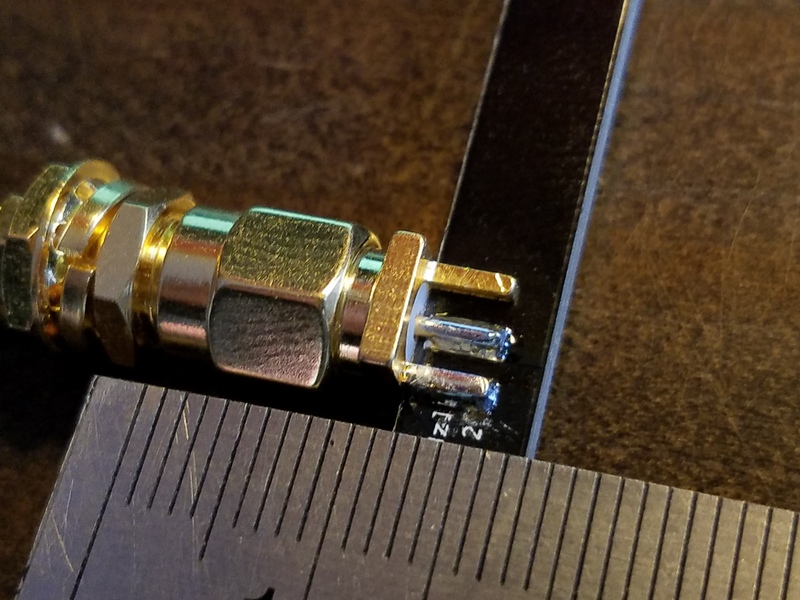 The one downside is that the u.FL connectors can only handle 30ish plug/unplug cycles so if you are wanting to test different dipoles (like me) you might eventually fry your u.FL jack on your Mote. I think that is the only negative and there are a few positives. I might grab 10 to fool around with myself; thanks! What about not using coax at all? meaning antenna would be almost next to output of RFM69, maybe 1cm away, 1/2"
Finally got mine from PCBs.io They are great! Haven't done any testing but below are some shots of the 5 PCBs I got. RE PCBs.io - It took 18 days to receive the boards, similar to my previous order (with free shipping). There is no tracking on the packages with the free shipping. There is no rush service like OSHPark. The quality is very good. As you can see the silkscreen is very crisp. For my own preference I always disliked the black soldermask, you can't see traces, it makes debugging PCBs very hard. Not sure why they chose this color, I would suggest them to change it to red or some other color. But for dipoles nothing can really go wrong and they look good. Would anyone like to see dipoles in the shop? I ordered some antennas and they came today. Just wanted to thank you for posting your work. You laid things out in an understandable manner so that I think I can get this to work for my setup. I'm working on a LoRa project and this helps a lot! Does it also make sense to make i as short as possible? Say I place the radio module output as close to the antenna input. Thank you NicksonYap. This idea of a zero-length-feedline has been both discussed and tested/troubleshot elsewhere on these forums and the short answer is this is a bad idea. There is a large amount of noise directly at the ANT output of the radio and RSSI will suffer very significantly. I believe joelucid was able to get this working by using a balun but the details escape me. It was buried in the original PCB dipole thread if you are interested. Would the design benefit from a ferrite balun such as this based on Martin E. Meserve (K7MEM)'s discussion on Center-Fed Half-Wave Dipoles? I'm no expert on the topic so I'm trying to glom together a myriad of resources online. Thanks! I need to read up on the feedline thing. Thanks! @LukaQ, can you take a pic of your setup? Thanks!